One factor holding back the widespread use of eco-friendly hydrogen fuel cells in cars, trucks and other vehicles is the cost of the platinum catalysts that make the cells work. One approach to using less precious platinum is to combine it with other cheaper metals, but those alloy catalysts tend to degrade quickly in fuel cell conditions. Now, researchers from Brown University have developed a new alloy catalyst that both reduces platinum use and holds up well in fuel cell testing. The catalyst, made from alloying platinum with cobalt in nanoparticles, was shown to beat U.S. Department of Energy (DOE) targets for the year 2020 in both reactivity and durability, according to tests described in the journal Joule. "The durability of alloy catalysts is a big issue in the field," said Junrui Li, a graduate student in chemistry at Brown and the study's lead author. "It's been shown that alloys perform better than pure platinum initially, but in the conditions, inside a fuel cell the non-precious metal part of the catalyst gets oxidized and leached away very quickly." To address this leaching problem, Li and his colleagues developed alloy nanoparticles with a specialized structure. The particles have a pure platinum outer shell surrounding a core made from alternating layers of platinum and cobalt atoms. 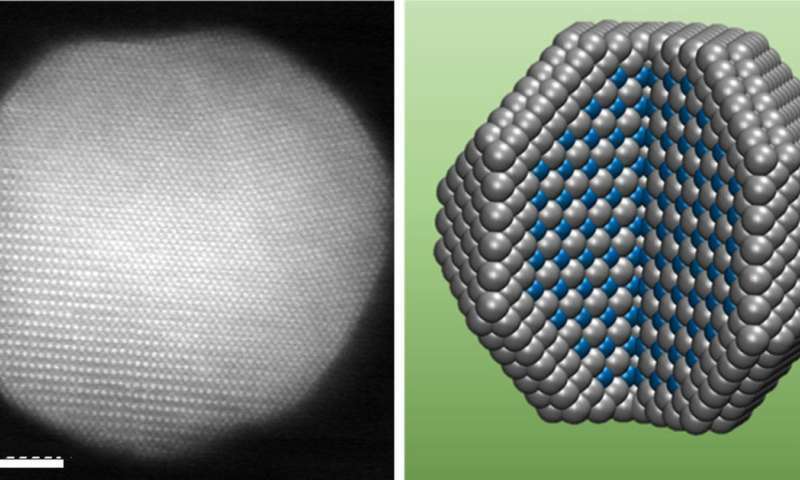 That layered core structure is key to the catalyst's reactivity and durability, says Shouheng Sun, professor of chemistry at Brown and senior author of the research. "The layered arrangement of atoms in the core helps to smooth and tighten platinum lattice in the outer shell," Sun said. "That increases the reactivity of the platinum and at the same time protects the cobalt atoms from being eaten away during a reaction. That's why these particles perform so much better than alloy particles with random arrangements of metal atoms." The details of how the ordered structure enhances the catalyst's activity are described briefly in the Joule paper, but more specifically in a separate computer modeling paper published in the Journal of Chemical Physics. The modeling work was led by Andrew Peterson, an associate professor in Brown's School of Engineering, who was also a coauthor on the Joule paper. For the experimental work, the researchers tested the ability of the catalyst to perform the oxygen reduction reaction, which is critical to the fuel cell performance and durability. On one side of a proton exchange membrane (PEM) fuel cell, electrons stripped away from hydrogen fuel create a current that drives an electric motor. On the other side of the cell, oxygen atoms take up those electrons to complete the circuit. That's done through the oxygen reduction reaction. Initial testing showed that the catalyst performed well in the laboratory setting, outperforming a more traditional platinum alloy catalyst. The new catalyst maintained its activity after 30,000 voltage cycles, whereas the performance of the traditional catalyst dropped off significantly. But while lab tests are important for assessing the properties of a catalyst, the researchers say, they don't necessarily show how well the catalyst will perform in an actual fuel cell. The fuel cell environment is much hotter and differs in acidity compared to laboratory testing environments, which can accelerate catalyst degradation. To find out how well the catalyst would hold up in that environment, the researchers sent the catalyst to the Los Alamos National Lab for testing in an actual fuel cell. The testing showed that the catalyst beats targets set by the Department of Energy (DOE) for both initial activity and longer-term durability. DOE has challenged researchers to develop catalyst with an initial activity of 0.44 amps per milligram of platinum by 2020, and an activity of at least 0.26 amps per milligram after 30,000 voltage cycles (roughly equivalent to five years of use in a fuel cell vehicle). Testing of the new catalyst showed that it had an initial activity of 0.56 amps per milligram and an activity after 30,000 cycles of 0.45 amps. "Even after 30,000 cycles, our catalyst still exceeded the DOE target for initial activity," Sun said. "That kind of performance in a real-world fuel cell environment is really promising." The researchers have applied for a provisional patent on the catalyst, and they hope to continue to develop and refine it. The major factor is that the "well-to-wheel efficiency" of hydrogen powered vehicles is atrociously low compared to battery operated ones...and there's basically no way to ever catch up, because: physics.